Article about JLP's book of stories Cal in Brown University's Forum for Modern Language Studies, under the title DEMARGINALIZING PORTUGAL'S ELDERLY: REPRESENTATIONS OF AGEING IN JOSÉ LUÍS PEIXOTO'S CAL, by Daniel F. Silva and Sandra I. Sousa. José Luís Peixoto reading from "The Piano Cemetery" in Glendale, Los Angeles, CA. 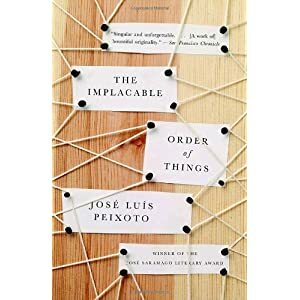 Jose Luis Peixoto reading from 'The Implacable Order of Things' ('Blank Gaze') in Santa Monica, CA. 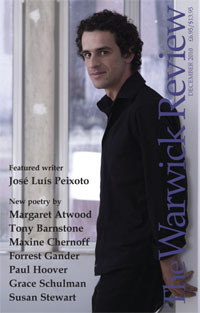 José Luís Peixoto is the featured writer on the December 2010 issue of The Warwick Review, published by the Writing Programme of Warwick University and edited by poet/translator Michael Hulse. José Luis Peixoto was born in a small village from the south interior of Portugal, in the Portuguese region of Alentejo. He finished a degree on Modern Languages and Literature in the Universidade Nova de Lisboa. Was a teacher for some years in Portugal and in Cabo Verde before becoming a professional writer in 2001. Peixoto's books are currently translated into 26 languages. Bloomsbury (UK), Doubleday, Random House (US), Grasset (France), Seuil (France), Literatura Random House (spanish-speaking countries), Companhia das Letras (Brazil), Einaudi (Italy), Kedros (Greece), Meulenhoff (Nederlands), Atlas Contact (Nederlands), Kineret (Israel), Wsoy (Finland), Polirom (Romania), Bozicevic (Croatia), Bakur Sulakauri (Georgia), among many others. “Peixoto offers an appealing addition to the genre of rural magical realism…. [A] poignant debut." Translated from the Portuguese by Daniel Hahn. The extraordinary story of two generations in a Lisbon family of carpenters and of a father's attempt to outrun his fate in the marathon in the Stockholm Olympics in 1912. Set in the working-class district of Benfica in Lisbon, "The Piano Cemetery" tells the story of a family, and especially of the hopes and fears of the fathers who pass the baton of the generations on to their sons. The Lazaro family are cabinet-makers who would rather be piano-makers. They have a carpentry shop in the Benfica district of Lisbon and there at the back is the 'piano cemetery' piled high with broken-down pianos that provide the spare parts needed for repairing pianos all over the city. It is a mysterious and magical place, a place of solace, a dreaming place and, above all, a trysting place for lovers. "The Piano Cemetery" is a wonderfully accomplished novel in which the true story of the Portuguese marathon-runner, Francisco Lazaro, is woven into a rich narrative of love, betrayal, domestic happiness and dashed hopes. Narrated in part by the father of Francisco Lazaro on the day his grandson is born and the day he himself dies and in part by his son as he runs the Stockholm marathon of 1908, remembering his family and his loves as he struggles against the heat and strives to outrun death itself. It is a beautifully constructed tale, that is by turns, violent and tender, funny and moving, with flashes of true insight, startling imagery and an instinctive understanding of families and their ways. "The Piano Cemetery" establishes Jose Luis Peixoto not only as the leading Portuguese novelist of his generation, but as a major figure on the international literary scene.